I’m delighted to announce a New Thing: a site (and soon to be ebook series) called Joe On Tech. The world already has enough sites that deliver tech news, tips, rumors, and industry analysis. I even write for some of them. But these sites tend to focus on the technology itself (especially new and future gadgets) and not so much on the people that technology is supposed to serve. Joe On Tech is about how people can improve their relationship with technology, with the emphasis on humans rather than on gadgets. My brother-in-law Tim is a carpenter. I’ve heard him talk about his work, but never about his tools. I’m sure he has the very best hammers and saws, but his main focus isn’t on the tools, it’s on what he can create with them. I can say the same thing about friends who are chefs, musicians, and scientists. They’d tell me about their knives, guitars, and centrifuges if I asked, but they don’t spend their days obsessing over the tools. They obsess over the work they can do with the tools. The answer might be to buy the new device. But it also might be to learn new skills, adapt existing technology to meet your needs, modify your goals to match what your tools can accomplish, or create entirely new technology yourself. At Joe On Tech you’ll find articles exploring a wide range of topics about the ways people use technology. I know “technology” is often a code word for consumer electronics (especially computers, smartphones, and tablets). I’ll talk about those things, but also about technology in its broadest sense of the way we do things, which might include anything from martial arts to space travel. You don’t have to be a tech geek to enjoy Joe On Tech. Just like Take Control books, it’s written for a general audience that may or may not have technical expertise. Everyone is welcome, regardless of your platform preferences or where you fall on the technophobe-to-technophile scale. If you’ve read any of my books or articles, you may have noticed that I like to explain the why and the how of technology—not just “do this,” but “understand why you’re doing this.” I want to make you smarter, so you can solve the next problem or answer the next question without my help. If your immediate reaction to explanations is “Eek! TL;DR! Don’t tell my why, just tell me what to do!” then I invite you, for your own happiness, to stay far away from my site. Another group who should avoid Joe On Tech is people who love ads. Sorry, but I can’t stand them, so I’m not going to show you any. Well, OK, I might show you ads for my own stuff, but I’m all about not annoying my readers—that doesn’t seem like a very good way to turn them into customers. Speaking of which…starting in June, I’ll also begin offering Joe On Tech ebooks for sale, very much in the spirit of my many Take Control titles (which, by the way, I will continue to write). The first several Joe On Tech ebooks I release will be just for Mac users. But later titles will cover increasingly diverse topics, in keeping with the overall theme of the site. Please click on over and check out Joe On Tech. While you’re at it, consider signing up for joeMail, which I’ll use (sparingly!) to update you about the site, my ebooks, and other things I think you’ll enjoy. I don’t know about you, but I’ve had a weird and exhausting year. Nothing went quite the way I expected it to, except in the predictable sense that half the things on my “Must Accomplish in 2014 No Matter What” list will still be waiting for me in 2015. But numerous signs suggest that next year will be more prosperous, less weird, and perhaps not quite so tiring. That would be very nice indeed. My 4-year-old son asked me a few weeks ago what I want for Christmas, and I answered him in the traditional way: “Two good kids.” In fact, my kids are fantastic already, and really the only thing I could ask of them is to let Daddy sleep a wee bit later in the mornings. As if. Of course I’d love to have a little more time and a little more money too. That will probably always be true. But I couldn’t wish for a better family, and that’s the best gift of all. It’s 72° and sunny in San Diego on Christmas Eve. The presents are (almost all) wrapped, I hear no crying at the moment, and we have alcohol. So I think we’re pretty well set for a merry Christmas. Whatever holidays you celebrate (or tolerate) at this time of year, I wish you all a feeling of contentment and joy. Call me crazy, but I don’t like doing unnecessary work. I already have more enough work that is necessary, and too few hours in the day. So I’ve long been in the habit of finding ways to streamline and automate everyday tasks that my Mac can do just as well as (or even better than) I can. 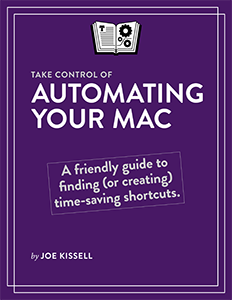 My new book, Take Control of Automating Your Mac, shows you how to do the same thing. This is my 45th Take Control title, and it’s one of my favorites. It was fun to write (and believe me, some of them were not! ), and as I worked on it I frequently took breaks to do exactly what I was recommending—find and implement shortcuts for tedious, mechanical tasks. So in fact the book became easier to write as I went along, since I was following more of my own advice! Anyone who uses a Mac can find lots of time-saving tips in this book. Spend a little time learning and setting things up, and you can reap the rewards for years. Plus, we’ve included coupons for eight popular Mac automation apps, collectively worth more than $60 in discounts, so we’re practically paying you to buy the book! I hope you like it. Here’s a little video trailer I made to introduce the book. 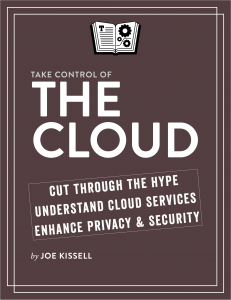 I’m delighted to announce the publication of my latest book, Take Control of the Cloud. This is a topic I’d been discussing with Take Control Books for about two years, but what with one thing and another, we could never make space for it in the publishing schedule. Well, it’s finally done and I’m really pleased with the result. The premise of the book is that lots of people (including some of those who already use cloud-based services like Dropbox, iCloud, and Google Docs) don’t have a clear idea of what the Cloud is, how it works, whether it’s safe, or how to make good decisions about which of the zillions of services to sign up for. When I speak to user groups and other audiences about online topics, the questions I get tell me that there’s a lot of confusion, anxiety, and misinformation about what’s out there and how different services compare. And that problem is only getting worse as cloud providers and services proliferate. So, this book is my attempt to explain the Cloud in plain English, for ordinary, nontechnical readers. Unlike most of my books, this one isn’t heavy on step-by-step instructions and technical details. Instead, it’s something you can sit back and read at the beach or in bed. I lay out the answers to common questions and offer advice for choosing and using several major types of cloud services. I give you the lowdown on privacy and security issues (spoiler: it’s scary out there) and even talk about the “personal cloud,” which is a way of providing online services for yourself without all the security worries of public services. If you’ve ever felt like you don’t quite get the Cloud, don’t worry—you’re not alone. And I’m here to help you make sense of it. I hope you find the book helpful! Here’s a brief video trailer.